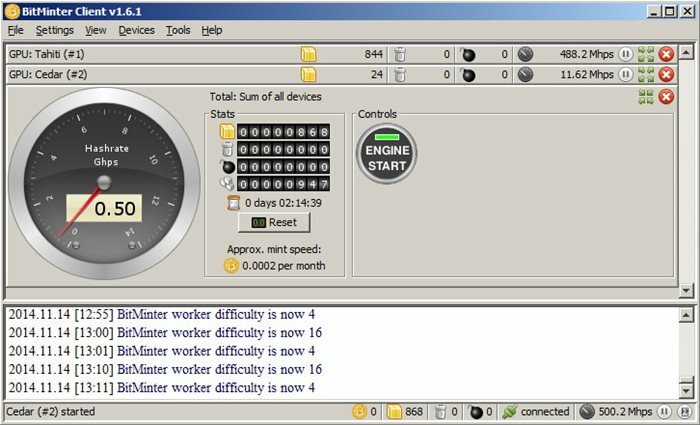 I use the BitMinter Client v1.6.1 This Java powered Mining App is easy to use and visually pleasant, especially for those new to Bitcoin Mining. By today's Standards my Mining Hardware is nothing to get excited about. They have USB sticks today that sell for $15 that can mine 10X what my video card can do. But now that I have turned my video card into a small office heater, I started wondering how much bitcoin could I make at today's Rates? The last time I wrote about bitcoin I posted a chart showing how much bitcoin you could mine at various Hash Rates. I have revised the number for today's hashing values. How much you will make Today at the following Hash rates? My Video card is mining at about 500 Mhps. This means I am making about 7 cents per month. Not a very good return. At least its keeping my office running nice and warm. If you search on ebay you will find thousands of guys selling their old mining hardware. You can buy USB mining sticks for under $10 now. However at current rates it will take you years to pay for it, assuming the difficulty doesn't continue to climb to infinity, of which it likely will. Buying a Miner today is more the novelty than anything else. Its kind of like putting a 20 watt solar panel on your home just to say you did it. Below are some of the Miners you can buy off ebay. Once again we will use today's current Bitcoin to USD conversions to calculate what kind of return we make with various hardware. The sad truth is none of these machines will pay for themselves within a year when you take into account electricity usage, cooling, and the rising difficulty of mining. By the time you have paid for them, they will be worth pennies on the dollar due to better hardware that will be available on the market. As much fun as it would be to fill my office with miners, Its not a very wise investment.